The case, Walker v. Sons of Confederate Veterans, U.S. Supreme Court, No. 14-144, is on appeal from the United States Court of Appeals for the Fifth Circuit in New Orleans. The Fifth Circuit found for the Texas Chapter. The State of Texas appealed to the United States Supreme Court. The Board of the Texas Department of Motor Vehicles denied the specialty license application by the Texas SCV Chapter in 2010. The Texas Chapter insists that the plate is designed to help maintain the “history and legacy” of those men who fought for the Confederacy in the United States Civil War. The reason given by the Board for the rejection of the proposed plates was that “many members of the general public find the design offensive.” A press release obtained by Breitbart Texas from the Texas Chapter says that although “The official public comments were heavily in favor of the Texas SCV’s application for a specialty plate, the board rejected the SCV plate at the hearing by an 8-0 vote without any discussion.” The officials had initially been split on the application, and on a renewed application. The veterans group note that the Buffalo Soldiers’ plate was approved at the same hearing by a 5-3 vote. The descendants of Confederate veterans are suing because they maintain that the Motor Vehicles Board is seeking to bar them from expressing their views, “while allowing all other groups to express their viewpoint.” The Texas Chapter argues that this type of restriction on speech is exactly what the First Amendment was designed to protect. The Texas Transportation Code provides that a license plate design can be rejected “if the design might be offensive to any member of the public.” The Board of the Department of Motor Vehicles cited this section of the law when rejecting the plate. The Texas SCV argues that this standard is unconstitutionally vague and indeterminable. 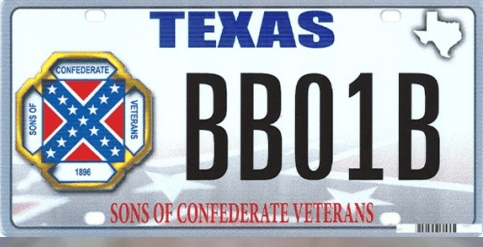 The Texas SCV declare “Essentially, it is no standard at all to say that the Board can discriminate based upon a viewing if such speech is offensive to anyone.” They also argue that as the Board approved the Buffalo Soldier plate the same day they rejected their license plate, this certainly cannot be the standard. They argue that the Buffalo Soldiers plate is offensive to Native Americans because the all-black cavalry helped fight Native Americans in the Indian Wars of 1867-1888. The legal question before the Court is whether the speech is government or private speech. If the message on the license plate is the government’s, then the First Amendment does not prevent it. If the motorist is the speaker, the government is prohibited from infringing on the speech in any discriminatory way. The intermediate federal appellate courts are divided on the issue of whether the speech is from the government or the individual. The Fifth Circuit found that a reasonable observer would regard the message as from the motorist and ruled for the Texas SCV. The district court ruled for the State finding that the message was private speech and the Board’s disallowance of it was not unconstitutionally discriminatory. Amici Curiae (“Friend of the Court”) briefs have been filed by the following groups: the Justice and Freedom Fund, American Center for Law and Justice, Children First Foundation, the Rutherford Institute, Cato Institute, American Civil Liberties Union, Americans United for Separation of Church and State, Foundation for Individual Rights in Education, Choose Life Wisconsin, Inc., and The Becket Fund for Religious Liberty. The State of Ohio, and the President Pro Tempore of the North Carolina Senate, have also filed amicus briefs. The Sons of Confederate Veterans have had specialty license plates accepted in Georgia, North Carolina, Alabama, Maryland, Mississippi, Louisiana, South Carolina, Tennessee, and Virginia.